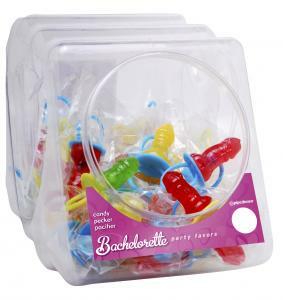 Candy Pecker Pacifier Fishbowl Display. Each sucker is individually wrapped. Assorted flavors include strawberry, cherry, orange and lime. Adult hard candy on a plastic ring pacifier style ring. Item Package Depth 10.25 inches, Package Width: 5.75 inches, Package Height 7 inches, Packaged Weight 2 pounds. Featured in Pipedream Products 2010 Spring - Girls Just Wanna Have Fun! Bachelorette Party Catalog, page 53. Fishbowl display and candy. These fishbowl containers are very versatile they can be used as a counter top diaspl or stacked together to make a free standing counter.